LCS2 enclosures and racks optimize management of cables and cords. It can be easily assembled and dismantled with a complete accessibility from doors, panels, pre-cuts and low opening. LCS2 wall-mounting cabinets can be fitted anywhere where maintaining aesthetic quality is very important. We are leading manufacturer and supplier of Rack Enclosures all over India . 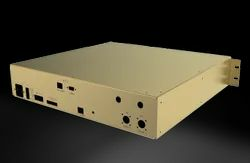 Size/Dimension: 25" X 21.6" X 17.7"
We are the reputed firm in the industry offering our customers with Rack Enclosures. - We offer a wide range of relay racks that are of high quality. We make use of the latest technology for its manufacture such that they give high performance and lasts longer.